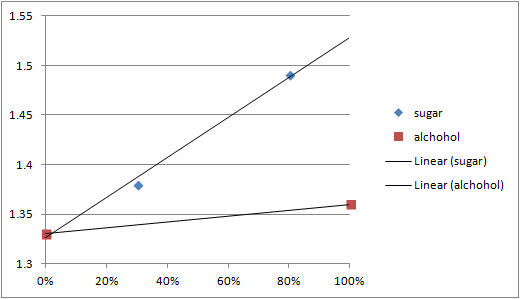 It is possible to calculate ABV without knowing the original gravity of the beer. There are several reasons why the original gravity may be an unknown. There have been a few cases where in the rush of getting the wort into the fermentor I have forgotten to take an original gravity measurement. In the United States beverages must be labeled to 0.1% accuracy ABV, but other countries, such as Belgium, have much looser restrictions. (1) With uncertainty of the ABV level the original gravity is going to be a guess. Hydrometers measure the relative density of a liquid compared to pure water. Dissolved sugar is denser than water, and alcohol is lighter than water. For original gravity measurements it is assumed that all of the dissolved material is sugar. 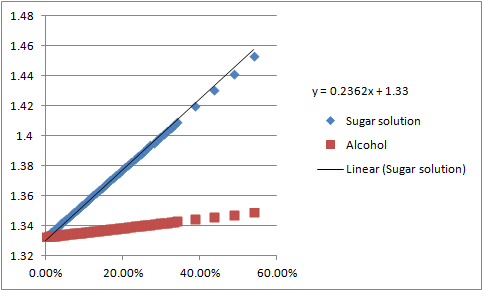 In final gravity measurements the assumption is that the change in density is caused by sugar converting to alcohol. Refractometers measure the index of refraction of a liquid relative to water. The assumption for the Brix scale on a refractometer is that all of the change in refraction is the result of dissolved sugar. As with a hydrometer, this is a reasonable assumption for measuring original gravity. However, although alcohol is approximately as dense as water, the index of refraction is significantly different. For this reason the Brix measurement of final gravity must be converted using a known original gravity. This is a common problem for many people the first time they take a final gravity reading with a hydrometer, but we can use this to our advantage. 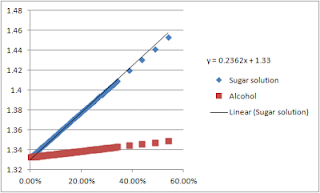 Because of the distinct difference in refraction index and density between dissolved sugar and alcohol the two can be differentiated from each other. The index of refraction of water is 1.333. Alcohol (Ethanol) has an index of refraction of 1.361. (8) Sugar water, has a fairly linear index of refraction as a function of solution by volume. 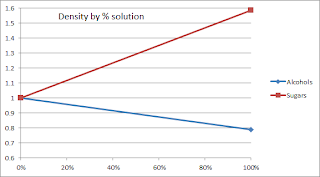 At a theoretical 100% solution the refraction index is 1.561 (2)(6)(7) Alcohol changes the index of refraction by only 0.028 from a zero to full concentration solution while sugar would change the index of refraction 0.228 which is about eight times more. This can be more clearly seen in the chart at the bottom of this post. Stay tuned to see how this works on some real beers. More useful would be the ABV level from final gravities as measured with a refractometer and hydrometer. Changes of 0.001 in the hydrometer reading can change the ABV by 0.5%. So it's important that this measurement is as accurate as possible. You way want to consider a precision range hydrometer such as the one at the bottom of this post. Table 1, Original Gravity from Final Hydrometer and Refractometer Measurements. Across the top, each column is for the final gravity as measured with a hydrometer. Down the left each row is the final gravity as measure with a refractometer. The cells in the middle are the calculated original gravity of the wort. Table 2, Alcohol By Volume from Final Hydrometer and Refractometer Measurements. The cells in the middle are the calculated ABV of the beer. Can this be modified to semi-accurately calculate OG by knowing FG and ABV? I could see that being useful for trying to make clones.